If you haven’t tried Batata Harra yet, you are in for a treat! 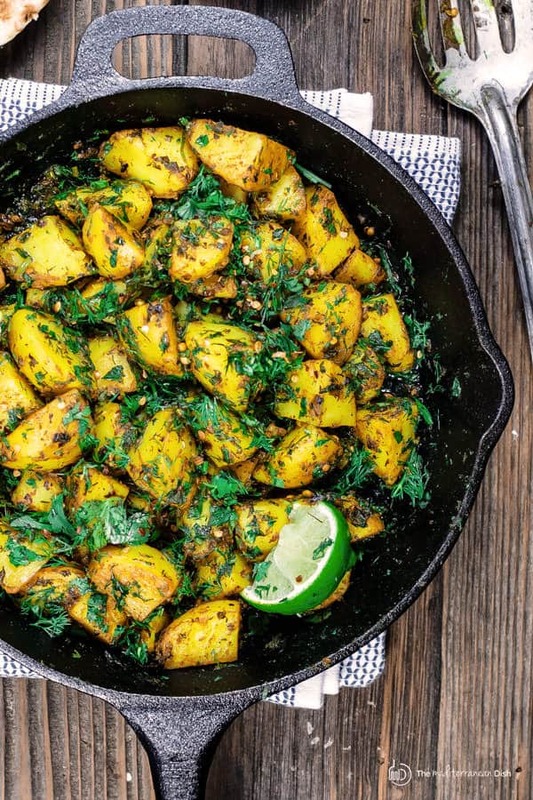 These quick Middle Eastern skillet potatoes pack tons of flavor from garlic, fresh herbs, and a unique mix of warm spices. A splash of lime juice adds a little extra brightness. These vegan and gluten-free spicy potatoes are such a versatile dish that comes together in 25 minutes or less! Be sure to see the video and step-by-step tutorial below. 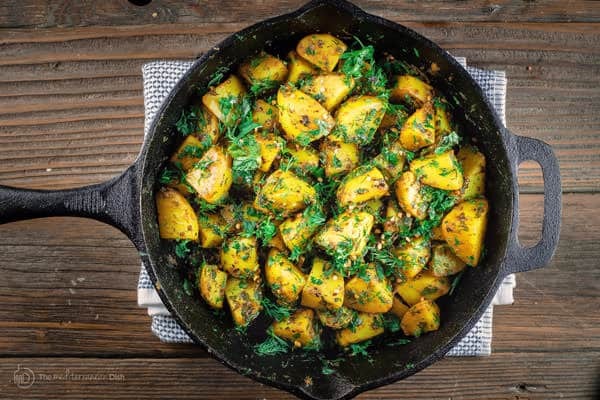 Batata Harra literally means spicy potatoes–a fairly popular Middle Eastern skillet potatoes dish. 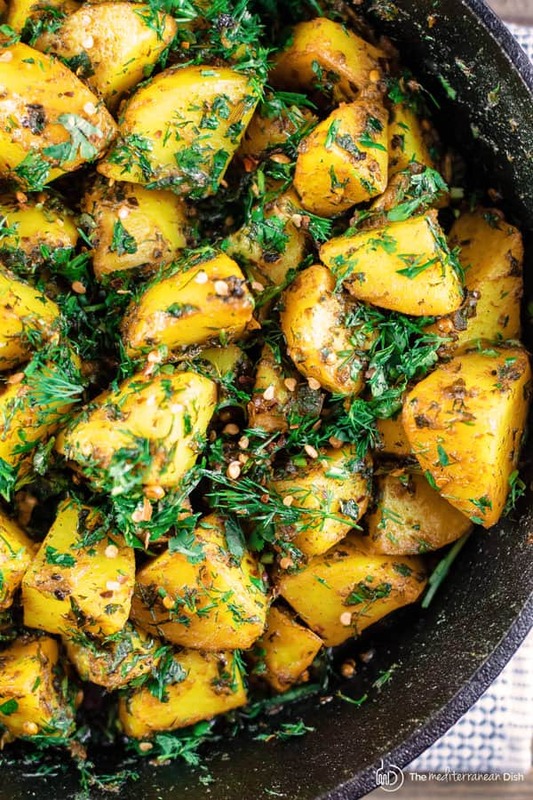 Batata Harra is a versatile dish that you can think of both as a side or or even a unique potato salad. And you will find several variations of it throughout the Middle East. In some countries, Batata Harra is extremely spicy, thanks to the the addition of harrisa paste. 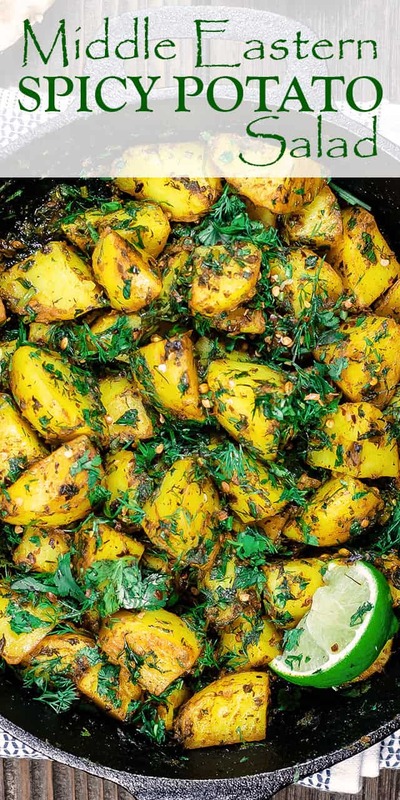 But in places like Egypt, where I grew up, you’ll find these skillet potatoes to be subtly spicy with just a sprinkle of crushed red pepper flakes, relying more on garlic, fresh herbs and warm spices like turmeric for flavor. 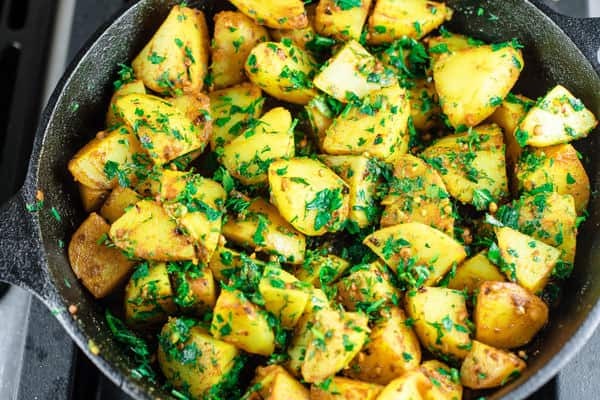 Today’s batata harra skillet potatoes lean more toward the Egyptian version; no surprise to you. It is not overwhelmingly spicy, and you can certainly adjust the spice level to your liking. 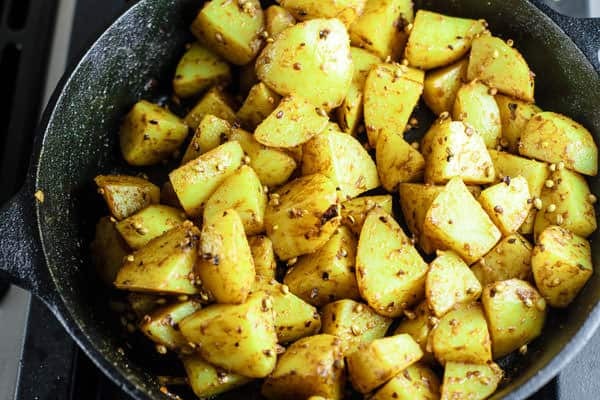 I like to serve batata harra as a simple side dish. It goes well with many meat dishes including baked kofta; chicken souvlaki; or even pan-seared trout. But it’s also meant to be enjoyed at room temperature as a potato salad; great with a dollop of Tzatziki sauce or plain Greek yogurt. If you’re up for a big mezze feast, definitely add these skillet potato next to other small dishes like hummus; roasted eggplant; tabouli; couscous salad or Tuscan white bean salad with shrimp. 2. Once potatoes are well cooked through (they should be soft in the middle that you can easily stick a fork through), drain and let cool briefly. Cut potatoes into cubes. 4. Now toss in the potatoes and make sure to coat them well with the lemony spice mixture. Add fresh herbs and toss again to coat. Let potatoes cook a few more minutes in skillet. 5. The final touches! Remove from heat and add more red pepper flakes (you don’t have to if it’s already spicy enough for you). Add more of the fresh herbs as well. 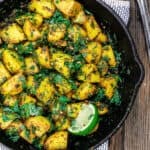 Easy skillet potatoes prepared Middle Eastern-style with garlic, warm spices, fresh herbs and a splash of lime juice! Vegan and gluten-free. 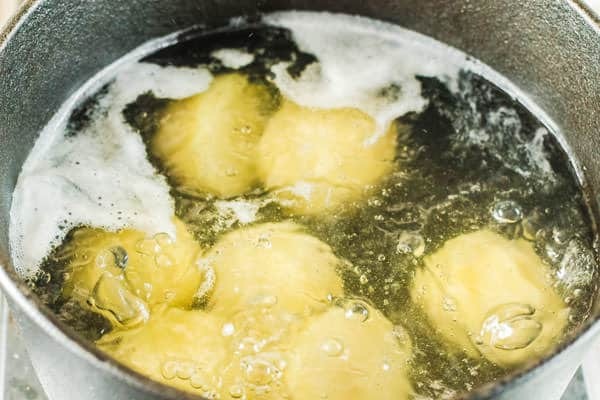 Peel the potatoes and place them in a large pot with enough water to cover them. Bring to a boil, and let them cook in the boiling water for 10 minutes or so. The potatoes should be cooked through but still firm. Drain the potatoes and let them cool briefly. 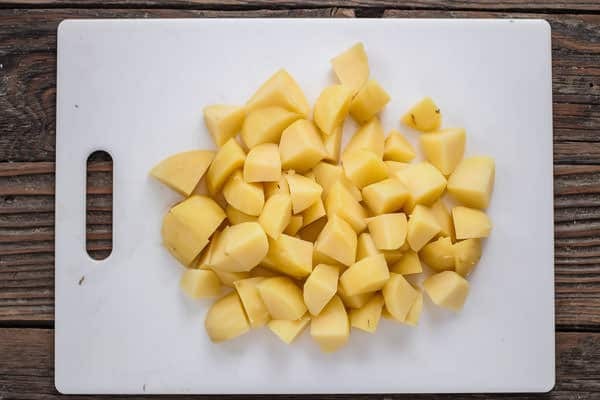 Cut the potatoes in smaller bite-size cubes or pieces. 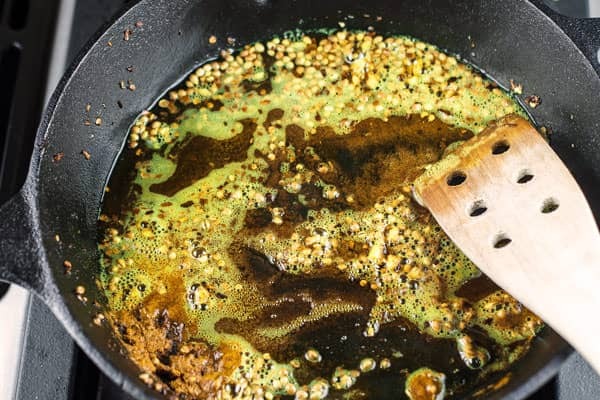 Heat the olive oil in a cast-iron skillet on medium. Stir in the garlic, red pepper flakes and coriander seeds. Cook for 2-3 minutes then add the turmeric and the lime juice. Toss in the potatoes, and mix well to coat. Add 1/2 of the fresh cilantro, parsley and fresh dill. Cook for 4 more minutes. 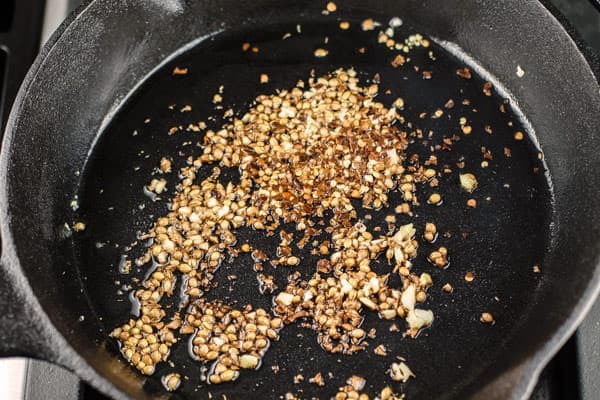 Add salt and black pepper to your taste. Remove from heat and top with more red pepper flakes and the remaining fresh herbs. You can serve this potato salad warm or at room temperature. Obsessed with your selection of herbs to use in this dish! Dill is one of my favorite herbs to use! This is seriously so delicious! Love how much flavor these potatoes have! So delicious! Yay! So glad you tried it! I love all the spices and flavor in this dish! Awesome, Courtney! So glad you liked i! I was out of new ideas of how to prepare potatoes and was so glad to see your recipe! These were wonderful!! Awesome, Sabrina! Love hearing this! Potatoes are a favorite side dish at my house, and these look so flavorful! Can’t wait to give them a try! I can’t wait to make this! I love these flavors! Hi Jake, you can start with less herbs, if you like.